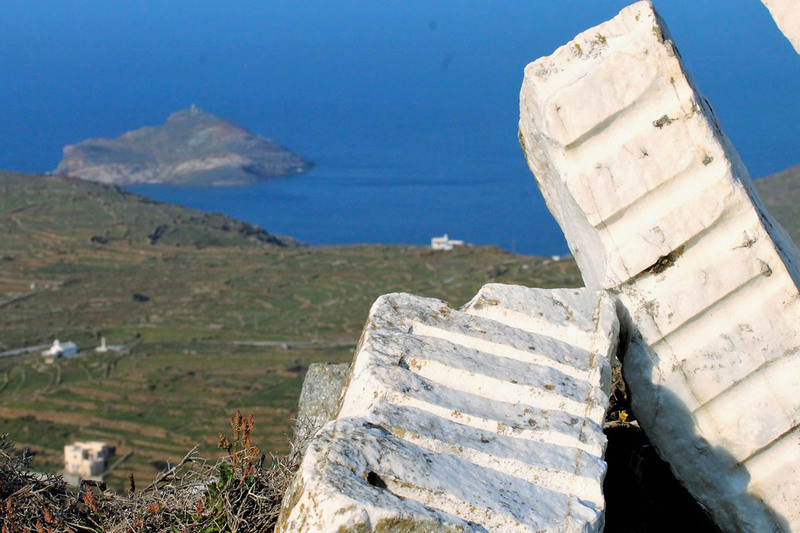 Run “Tinos Marble Trail 2016” and experience the wild natural landscape of the area, featuring impressive gorges, virgin beaches and rocky coasts, as well as the manmade features, including traditional villages and abandoned settlements, handmade footpaths, old stone-walls, remaining windmills and pigeon houses, marble quarries, white-plastered monasteries and churches. 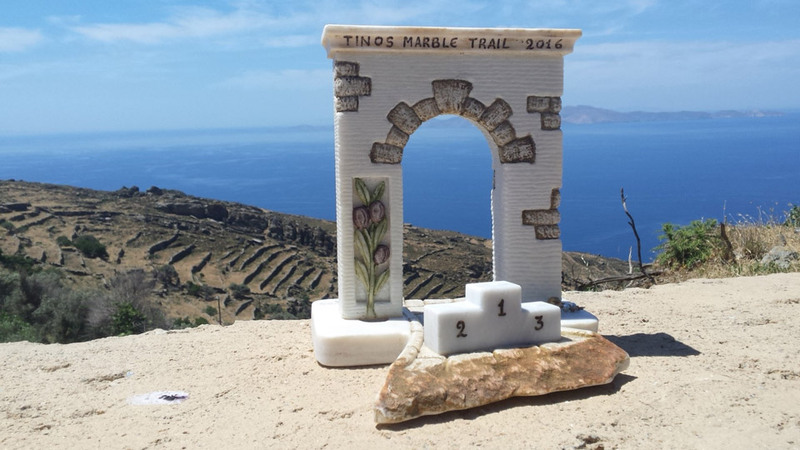 Welcome to “Tinos Marble Trail 2016” taking place in Tinos, a spiritual island, offering a mix of religious traditions and unspoiled architecture and natural beauty giving to it a particular character. Runners can enjoy beautiful beaches and its traditional villages, the simplicity of the life, the gentle curve of its hills, the artistic wealth of its' painters, sculptors and their works. 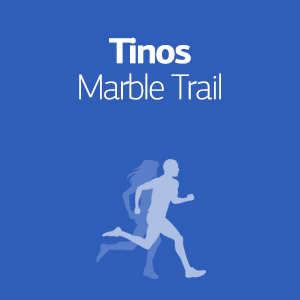 Participating in “Tinos Marble Trail 2016” provides a remarkable occasion for runners to enjoy a marble village, which is considered one of the most beautiful settlements in Cyclades. Runners will travel to the lairs of art, run on streets "paved" with marbledust, history and artistic tradition. They can run around marble-built villages and recognize the "carving" of nature, wind and rain at the harsh landscape of the Tinian north. We offer several options varying from short weekend breaks in Tinos including your entry to the race, to a full vacation plan in Tinos and the surrounding area! Moreover, we can offer you training plans, actual training in the streets and routes of Tinos and of course we will run with you! Registration is open until Monday, 29th of August 2016 or until a specific number of applications is reached. 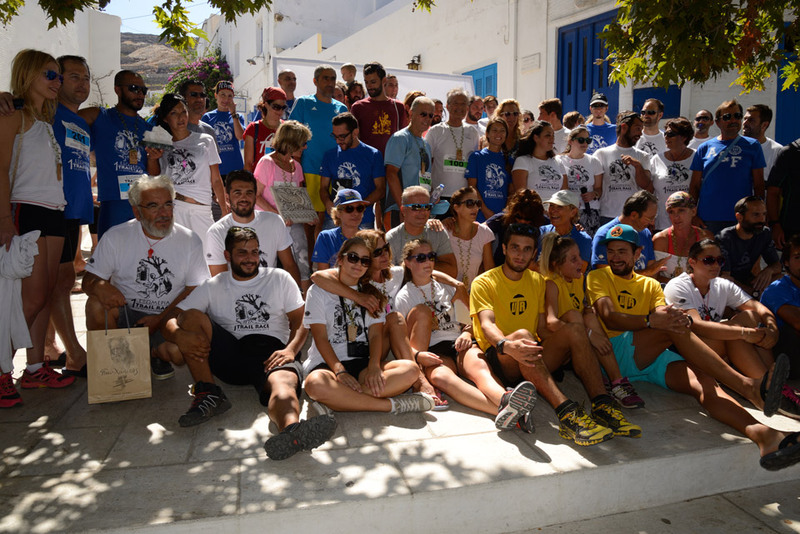 The start will take place in the central square of Pyrgos village towards the north and enters a steep path leading to the windmills to the picturesque village of Platies, where is the first Aid Station (2.20km). From this point runners continue to the stream of kanalistras and then downhill to the chapel of Agia Paraskevi in Karabousa, where is the second aid station (5.17 km). The dirt road leads to the beach Rohari (7.20km) and continues to a difficult trail uphill for 700 meters where it ends at the village of Panormos Bay and the third aid station (9.70km). 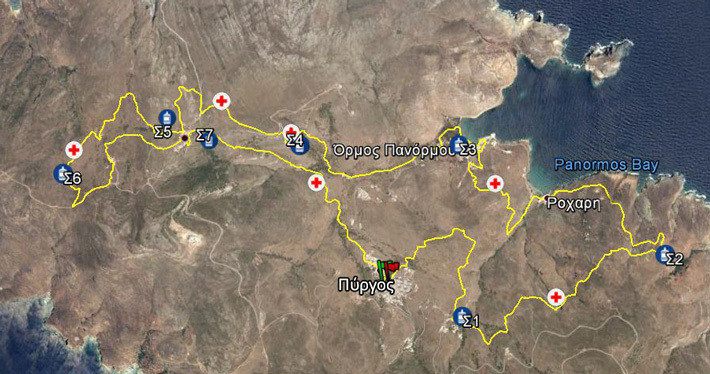 With west direction following the path Panormos and monastery Kyraxenis (12.00km) Aid Station, and then continues until Marla settlement (14.00km) Aid Station. Then runners head west passing through the ruined village of Ismail (16.00km), Aid Station and climb up the hill (+276) and from there they go downhill South East until the settlement of Mamadou (17.40km). The path returns to the traditional village of Marla (18.50km) Aid Station, and stars the long descent towards the south, passing through the abandoned village of Kato Marla (19.00km) until the stone bridge Pologianni the Well. 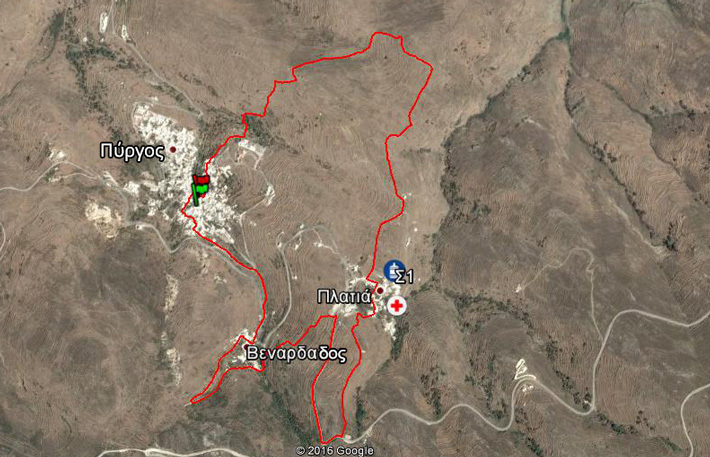 The start will take place in the central square of Pyrgos village towards the north and sunners enter a steep path leading to the windmills to the picturesque village of Platies, where is the Aid Station (2.20km). 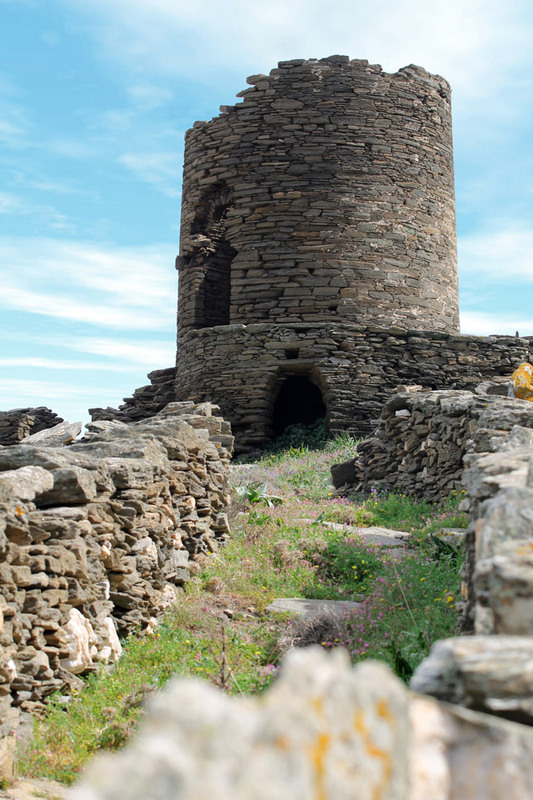 After passing through the Settlement runners enter the path that leads to the old chapel of St. John and from there towards northwest go into asphalt and connected to the downhill path that leads to the settlement of Venardadou. 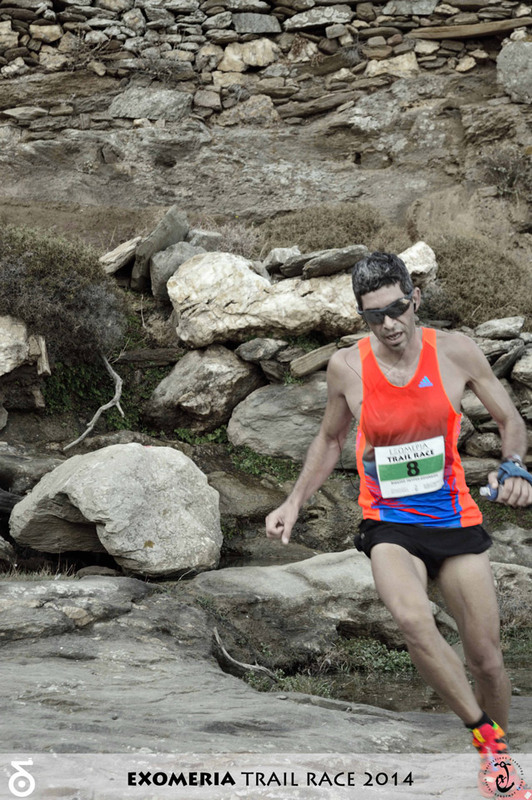 Runners pass through the village uphill section directed west and ends in the final part of the route that reaches downhill in the square of Pyrgos village, where is the finish line. The first 3 males and females of each race will be awarded. 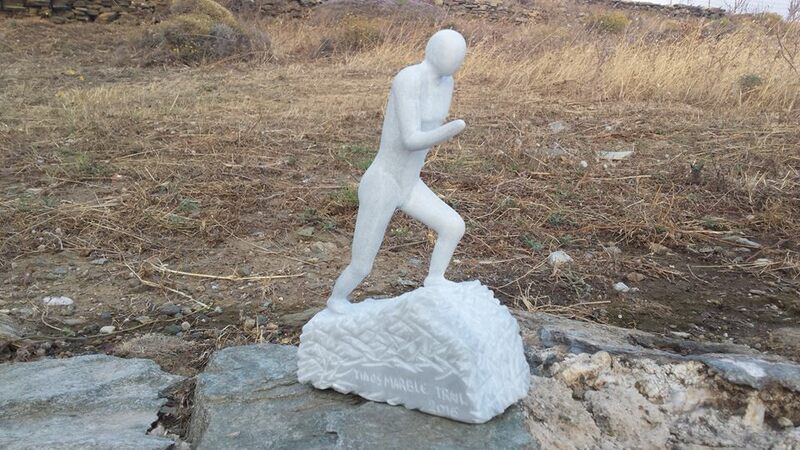 The first man and woman of the general classification and the first runner from Tinos (man and woman) in Ishmael Trail will receive unique prizes which are valuable marble sculptures crafted by local sculptors of Exomeria designed exclusively for the event. Also the first man and the first athlete of the general classification at the Mills Trail will take corresponding marble prize. All participants in all runs will receive a commemorative medal. The Simple offer is addressed to those who wish to come and stay in Tinos on their own. This offer is ideal for those who want to experience Tinos the “running way”, and get the most out of their visit in Tinos. We have selected the ideal locations for you, and we will suggest you the ideal vacation plan. The Simple offer is addressed to those who wish to come and stay in Tinos on their own. It includes all the logistics of the race entry, transportation to and from the starting line, tips and advice for the specific race, training schedule depending on your personal targets and safe keeping of your belonging during the race. If you really want to feel like a champion, we are here to support you! This offer is ideal for those who want to experience Tinos the “running way”, and get the most out of their visit in Tinos. We have selected the ideal locations for you, and we will suggest you the ideal vacation plan. This offer is for those who wish to go to Tinos on Saturday morning and return to Athens on Sunday night. It starts from €45 per person (runner or not) for a two days/one-night accommodation in Pyrgos or Panormos Village. If you wish to stay longer, you may add as many nights as you want for an additional €20 per night per person. Please tell us all your requirements and preferences, how many days you want to spend in Tinos, what other places you wish to visit and we will come back with a tailor-made offer specific for you! We can add trainings, running tours, car/bike rental, excursions, family activities and many more. In any case our offer will include the hotel arrangements, transportation to and from your hotel, participation to the race and all the logistics of the race entry, transportation to and from the starting line, tips and advice for the specific race, training schedule depending on your personal targets, safe keeping of your belonging during the race and suggested vacation plan for all the days that you will be in Tinos. We can add trainings, running tours, car/bike rental, excursions, family activities and many more. In any case our offer will include the hotel arrangements, transportation to and from your hotel, participation to the race and all the logistics of the race entry, transportation to and from the starting line, tips and advice for the specific race, training schedule depending on your personal targets, safe keeping of your belonging during the race and suggested vacation plan for all the days that you will be in Tinos. Tinos island is the northernmost and second biggest of the Cyclades Islands, a high quality alternative destination, with a history dating back to ancient times, outnumbered sightseeing attractions and many settlements to visit. 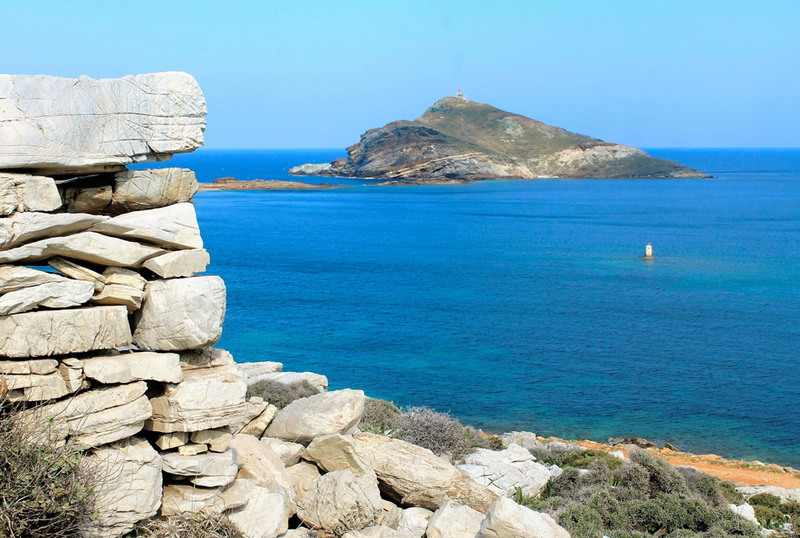 A fairly green island for the Cyclades, Tinos offers some really nice beaches, pretty villages and a quiet, relaxed atmosphere. The capital of the island, Hora is home to famous Greek captains and ship owners, and there is a remarkable combination of medieval, neoclassical and island style evident in its houses. Flights of stairs, a spacious square with trees, narrow streets, remarkable churches and museums, shops, cafes and restaurants play their part in the beauty of the place. 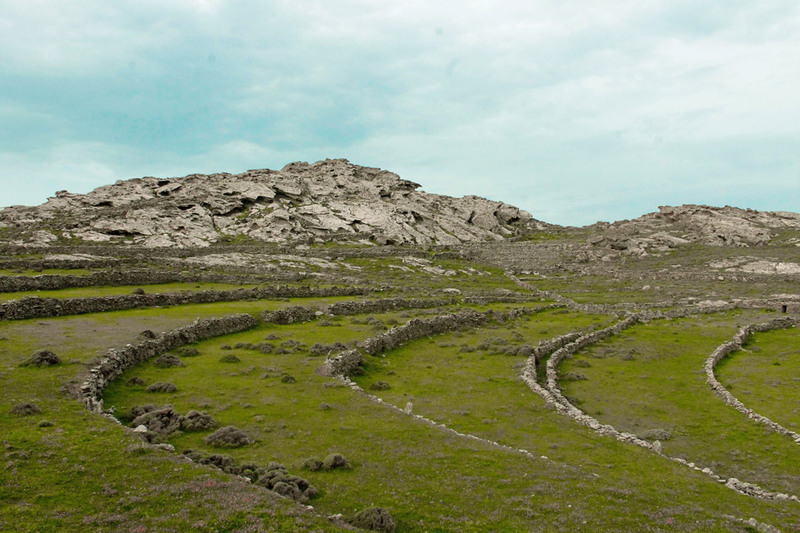 In addition to the sandy beaches, there are rocky coastlines, mountain ranges alternating with fertile plains, lush vegetation and abundantly flowing streams.Batsi is the most tourist developed place in Tinos island and it is surrounded by wonderful beaches, including Golden Beach and Agios Petros. The coastline of Tinos is particularly rugged creating many small, picturesque bays, which mostly have good sandy beaches. Some of the largest bays on the island which are worth mentioning are Gavrio, Batsi, Hora and Korthion, all of which have organised harbours, Also is the bay of Fourni and in the north is the beach of Agios Petros, which is mentioned by Lloyds as a safe haven for boats. 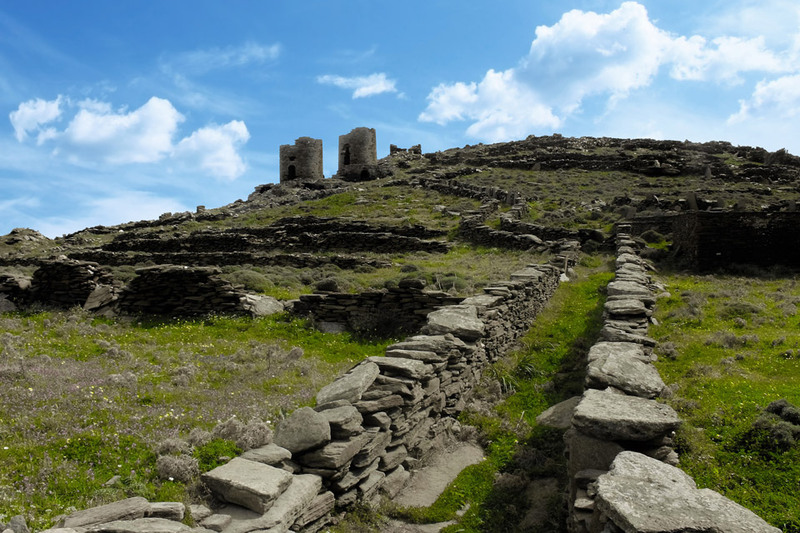 Tinos is definitely worth a visit and can be seen solely as a cultural tourism destination, thanks to its museums. The globally acknowledged Museum of Modern Art, houses unique collections of paintings and sculptures. 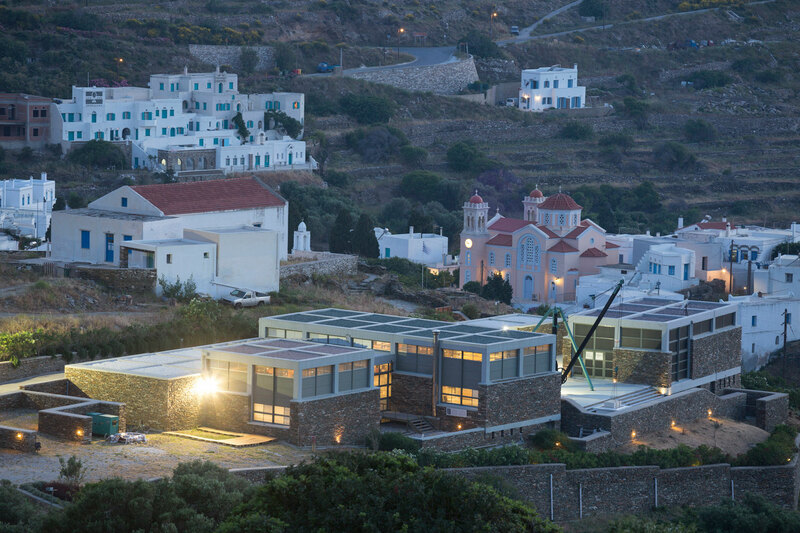 The Cyclades Olive Museum is a fine example of a small pre-industrial, animal powered, olive oil producing unit that is definitely a must-see site. Pyrgos is the largest village on the island with its 400 residents. Home to some of the greatest Greek artists like Y.Chalepas (sculptor), N.Lytras (painter), D.Philippotes (sculptor) among others. Walking past the alleys of Pyrgos one can encounter art in every corner, house, church or square. Pyrgos took its name from an ancient tower which was built before the 16th century in order to secure the whereabouts. The village flourished during the 18th and 19th century mainly because of the marble art and shipping. The most important sights of the village are the two cathedrals, Agios Nikolaos and Agios Dimitrios, the Museum of Marble Crafts, the cemetery where the visitor can admire marbled works of art and stone carvings of local artists. Moreover it’s the Tinian Artists Museum, located at the entrance of the village right next to the house where Y.Chalepas lived which is also a museum these days. As described on tab "Travel Offers"